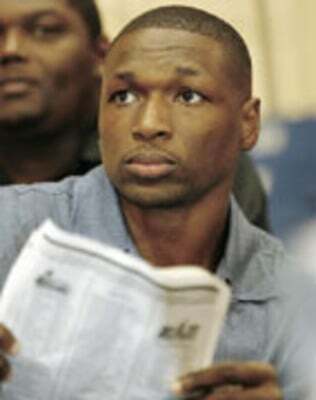 New Rome Gladiators owner Theo Ratliff took in his first game Wednesday night at The Forum, and though Rome lost the game 68-64 to the Macon Blaze, Ratliff came away impressed on a number of levels. “I got lost coming up (from Atlanta), but when I drove around town, it looked similar to a lot of places I’ve been,” Ratliff said. “I’m very excited. It’s a small community, but it has two professional sports franchises. It’s a great situation and we want to give people something to come out to and be a part of. Ratliff, a power forward/center who is considered one of the top defensive players in the NBA, played college basketball at Wyoming and was a first-round draft pick of the Detroit Pistons in 1995. He has also played for the Philadelphia 76ers, Atlanta Hawks and Portland Trail Blazers, with whom he finished the 2003-04 season. For his career, the 6-foot-10 Ratliff has averaged 8.7 points, 6.4 rebounds and 2.8 blocks in nine seasons. The 31-year-old Ratliff is the Gladiators’ third owner since Christmas. Prior to his arrival last week, the World Basketball Association had been paying the Gladiators’ bills since Joe Costello of Suwanee backed out as owner a week before the season started over “philosophical differences” with the league. Arnold Gervais was the Gladiators’ original owner, but the World Basketball Association terminated Gervais’ contract to own a franchise in December because he didn’t meet all of the ownership requirements that the league had set. Going into tonight’s game at The Forum against the Jackson Rage, the Gladiators are 3-8, which puts them last in the seven-team WBA and five games behind the league-leading Rage (7-2). After winning its season opener on April 29, Rome lost seven of its next eight before beating the Kentucky Reach 70-67 on Sunday at The Forum. The seven losses included four setbacks by five points or less. Gladiators head coach/general manager Harold Ellis said having a new owner in place with the solid background Ratliff should net positive results over the final nine games of the season. “I feel so much better because now I know there’s a solid guy in place that I can trust,” said Ellis. “Now I can stop worrying about paying bills and hand all that over to (Ratliff) and take care of the basketball end of things. Because he is taking over in the middle of the season, Ratliff knows it will be a tough task to try and sell Greater Rome on the Rome Gladiators this year, but it won’t stop him from trying. “I think we can make this team work in this community,” Ratliff said. “We’ve just got to grind it out and get out in the community and let people know about this team. “I’m glad that I have the chance to be involved with the Gladiators and the league. There are a lot of exciting players and the game (Wednesday) was very entertaining and that’s what people want to see.